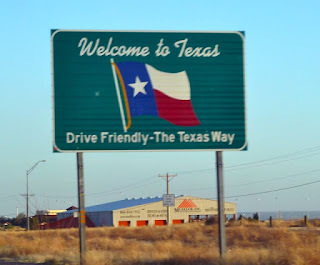 As we entered Texas, I noted that I was now in a state that I had never visited before. Exiting the freeway, I noticed that the traffic lights were situated sideways on the pole (horizontally instead of vertically). Immediately to the right flowed the Rio Grande, and beyond that, Ciudad Juarez, the most dangerous city in Mexico. What a sharp contrast: El Paso is one of the safest cities in the US. We arrived at the apartment of our host, Chris, and he was actually outside, moving his truck into his garage. Perfect timing! It was about 8pm, and Chris was enthusiastically willing to show us around. We rode in his classic '63 Chevy pickup up the mountain to a wonderful viewpoint overlooking the entire city. It was spectacular, and more scenic than I thought. 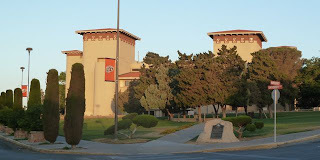 We looked form Fort Bliss in the east (the largest military base in the US) and south across the city into Mexico, and west toward the University of Texas, El Paso. Apparently the architecture of UTEP's campus is inspired by the architecture of Bhutan, which I found very interesting and unexpected. Chris is in the army, so he had to get up early in the morning, which meant no late night out for us. But we did go to a cool modern cafe nearby, where Ueli and I split a burger (chiles in a chipotle cream cheese spread) and chile verde mac n cheese! And then we had the best tres leches cake in El Paso; it was moist and truly delicious. Only two hours in El Paso and already an amazing experience. This city has way more to offer than I imagined. There are some really nice houses on the hills overlooking the city. There is a strip of cool restaurants and cafes near the university. And there's the history of an old railroad and border town, and the income of a huge military base. El Paso is a necessary stop for anyone traveling along the 10, but it's also a worthwhile stop.